Today’s DIY GIFT GUIDE post is even easier than yesterday’s and would look super cute on your Christmas tree! Know someone who sews? Then this would be the perfect gift for them! 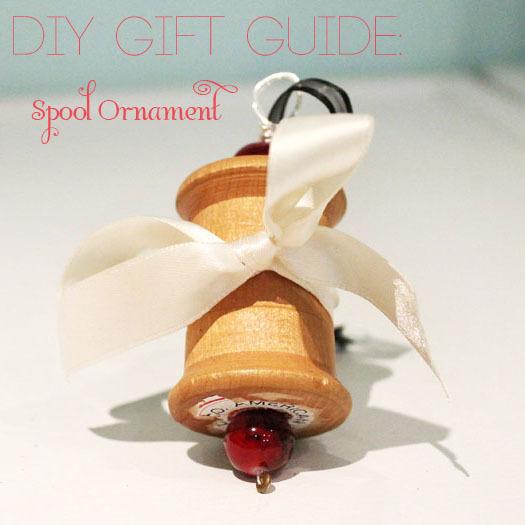 Turn an old wooden spool into a Christmas ornament in just a few steps. The worst part of this project is the first part. Remove any old thread from your spools so they are completely bare. I did the by unraveling each spool, but if you don’t have the patience (not sure how I did) you could score yours off with an exacto knife. Once your spools are naked (hehe), cut a long pice of wire and fold it in half. Thread a seed bead onto the end and let it rest in the bend of the wire. This will stop your larger beads and spool from falling off of the wire. Thread your beads onto the wire — thread through both ends of the wire. Thread your wire through the spool, then add beads on top. I liked my ornament simple and just added one bright red bead below and above my spool. You can add as many as you’d like. Create a loop in the wire after you add your last bead, then secure the wire by wrapping the long ends around the base of the loop until your wire runs out. Tie a piece of ribbon through the loop to make a hook for the tree. 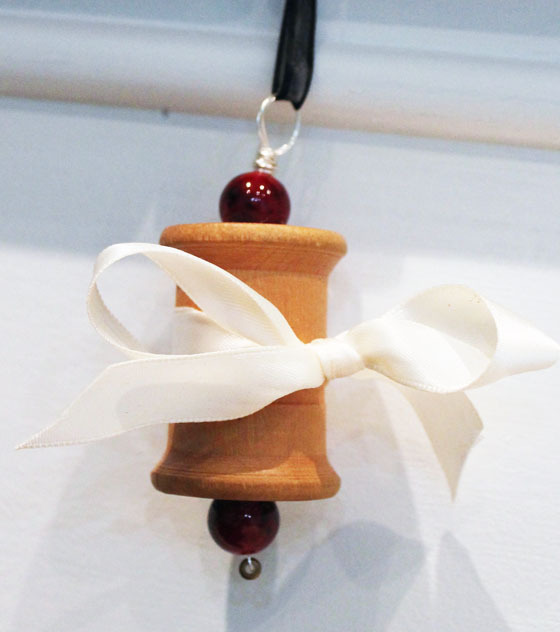 Embellish your spool with a large ribbon. Ta da! Hang on your tree! 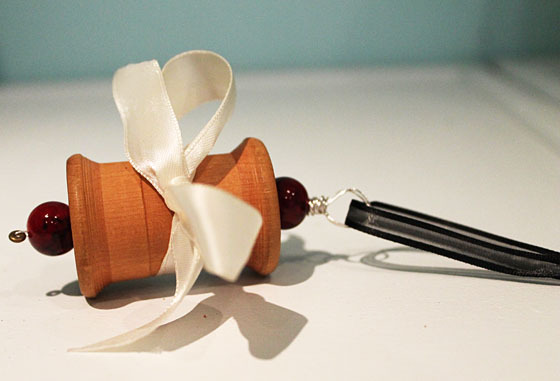 If you want to get fancy, seal the ends of your ribbon with a no-fray fabric treatment. I haven’t done that to mine, but I probably will before I gift them.